The Dolphin Cloud on Jupiter | Phuks! > Do you see the dolphin-shaped cloud on Jupiter? The cloud was visible last year during perijove 16, the sixteenth time that NASA's robotic spacecraft Juno passed near Jupiter since it arrived in mid-2016. During each perijove, Juno passes near a slightly different part of Jupiter's cloud tops. 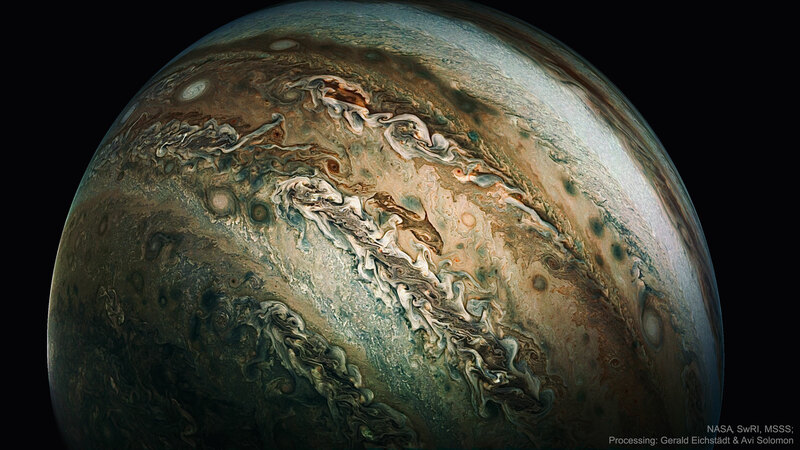 The dolphin shape may be surprising but is not scientifically significant -- clouds on Jupiter and Earth are constantly shifting and can temporarily mimic many familiar shapes. The cloud appears in Jupiter's South Temperate Belt (STB), a band of dark and dropping clouds that rings the planet and also contains Oval BA, dubbed Red Spot Jr. The featured image was digitally processed to enhance color and contrast. Juno's next swoop near Jupiter -- perijove 20 -- will occur on late May. First the Face on Mars, then the Hexagon on Uranus. Now this.